Planters Old Fashioned Peanut Brittle. Compare the brittle on the box with the brittle on the plate. Notice anything missing? See image below for answer. Goodie! It’s that time of year again when a few hundred square feet of every grocery store becomes a temporary enclave of Christmas snacks, full of icy squares, Turtles and Toblerone bars the size of fence posts. I can’t say I’ve ever tried to find peanut brittle outside of the holiday season, so I’m not sure if it’s even available in, say, June. I’m more familiar with it as a homemade treat, given to lucky friends in a festively decorated tin. 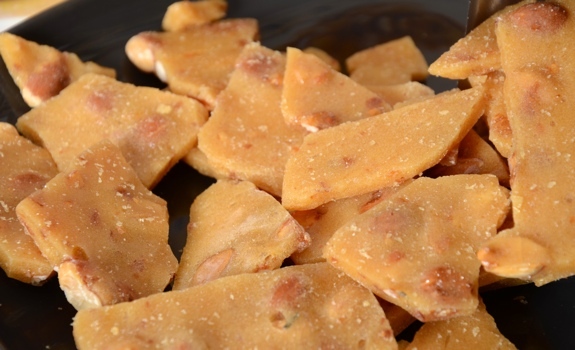 But sometimes, there’s nobody in your life that makes peanut brittle. Sometimes, you just have to trust Big Confectionary to supply you with your caramel peanut fix. This box of Planters brand peanut brittle comes from my local Calgary Co-op’s Christmas island, within striking distance of marzipan tubs (if that’s not a blues musician’s stage name yet, it should be) and cellophane-wrapped fruitcakes. Ho, ho, ho. The Look: Basic box with a tempting photo of a very peanutty peanut brittle broken into pieces. In reality, there were way fewer peanuts in the product inside the box. How paltry was the peanut selection? Most pieces of brittle were almost entirely caramel, with a couple peanut bits to break the sugary monotony. There were several large shards of caramel dotted with only a few stray flecks of peanut. The Taste: Crunch! Solid, but crumbles easily with a bit of tooth pressure. I wouldn’t call the caramel creamy (which makes sense, since neither cream nor butter are anywhere to be found on the ingredients panel), but it has that sweet, cooked sugar flavour, nonetheless. Beyond the roasted peanuts and caramel, the standout flavour here is baking soda, which has a light fizzling effect on the tongue, but quickly becomes annoying. And seriously, Planters. You’re a peanut company. Your company spokesperson is Mr. Peanut. So why are there so few peanuts in your peanut brittle? Answer, from question above: Peanuts! This peanut brittle is almost all brittle with hardly any peanuts. Cost: $2.49 for a 230 gram box at Calgary Co-op. Value for cash money: Good, until you taste it. Availability: Should be easy to come by for the next month or so. Nutrition? : Per 1/5 box (46 grams): 210 calories, 8 grams of fat, 160 mg of sodium, 2 grams of fibre, 4 grams of protein. The verdict: Not as good as I was expecting. I really didn’t like the baking soda taste, which I found distracted from the other flavours. I’d seek out another brand, or maybe craft some of my own peanut brittle in the kitchen. There are plenty of recipes online. Yes, we just bought this product and were equally surprised that the picture on the box, which looked so appealing, was nothing like the product inside. There hardly any visible peanuts in the actual product. We feel ripped off. 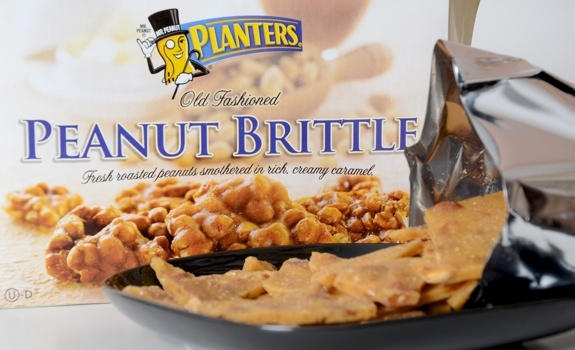 Planters Old Fashioned Peanut Brittle falsely advertises and is a really sham.